Discover the enhanced performance and soundness that can result from the correct fit. This DVD from the famous and well respected holistic DVM Joyce Harman, is an educated and well explained and demonstrated viewpoint on perhaps one of the most obstructive issues that hampers your horse and his performance. The correct fit of a saddle comes down, not to the name brand, but its construction condition and fit. Joyce here explains exactly how to do it including the ancillary issues that go along like the proper use of saddle pads, conformational challenges and how you as a buyer can educate yourself in how to evaluate a saddle both on and off the horse. Not often taught in the riding school or at the expensive lesson, riders are expected to know which is hard when it isn't taught. It is not usually necessary to go out and buy an expensive saddle or a custom saddle to remedy fit issues, good design comes at many price points. 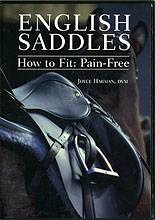 Save yourself money and most importantly your horse hours of discomfort and possible long term chronic injuries by educating yourself once and for all in English saddle fit.